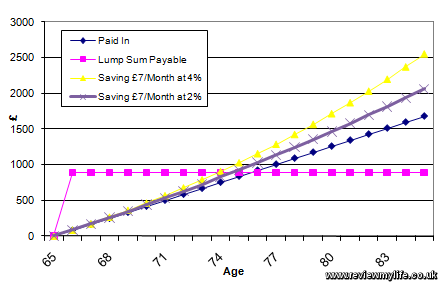 Two years ago I produced some graphs showing how much you might pay vs how much you’d get back with two over 50 plans from AXA Sun Life. Today (Saturday 16th October 2010) The Times has included one of these graphs in its paper, so I thought I’d produce another set of graphs for a different company. This time it is The Post Office. As before I’ll mention that I’m not a financial advisor, I have no personal connection to these kinds of plans, and I’m not making any kind of recommendation. 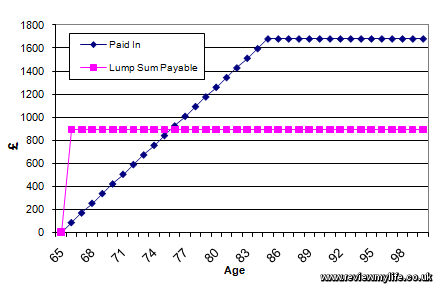 All I am doing is turning the numbers for the Post Office Over 50’s Life Cover plan into some graphs. I’ve done my best to make these graphs accurate, but if you spot any problems leave me a comment. I got a quote for a 65 year male using their website based on paying in £7 per month. Using these figures will get you a fixed £892 lump sum (or rather your family will), payable on death. You get this lump sum if you die after the first 12 months. If you die in the first year you get your premiums back. Your payments stop after 20 years when you are 85, and there is no cash in value. So if you stop making payments you get nothing back. There are some other terms which affect the plan: if you die in an accident within the first 12 months you get your full premium back, and if you die of an accident after the first 12 months you get double your premiums back. I am not taking these additional terms into account for my graphs, but of course you might take them into account if considering a policy like this. That is a rough summary in words – but what does it look like when turned into a graph? 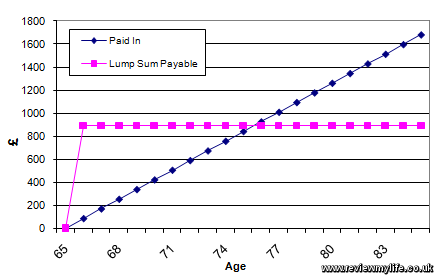 The pink line is the lump sum payable which remains fixed, and the blue line is what you pay in. This remains fixed until you have paid in for 20 years. This person starts paying more in than they’d get out of the plan once they reach 76 years old. It can be useful to compare the figures against what you’d get if you put the money into a bank account. This graph has two additional lines. One for saving this amount monthly at 2%, and the other at 4%. These plans are all to do with when you die. Obviously the companies selling these plans have to make a profit (you don’t think anyone would give you free money do you? 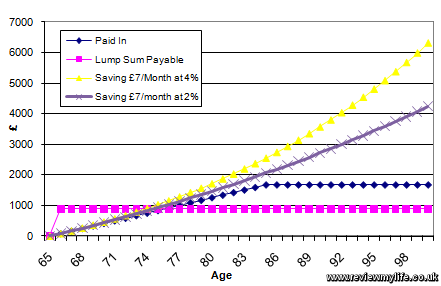 ), so they use the average life expectance to work out how much life cover to give you. Some people will get more than they paid in, but as with all other kinds of insurance the company has to make more money back. If the companies who make these policies paid out more than you gave them (on average) then they’d go out of business. The National Statistics Office produce tables of life expectancy information. By looking at the ‘Great Britain, Interim Life Tables, 1980-82 to 2007-09’ I can see that a 65 year old male has a life expectancy of another 17.61 years. This means a man who is now 65 years old will die when he is 82.61 years old (on average of course). Here are the above two graphs again, but this time with a smaller scale. Instead of being from 65 to 100 years, they are from 65 to 85 years. Again as I mentioned above these kind of plans do offer other benefits such as accident insurance, so you have to make up your mind using all the available information. But I hope you can see that a little bit of work in Excel can make the numbers a lot easier to understand. The Post Office Over 50 Life Cover page is here, and on this site you can find similar but old graphing information for the AXA Sun Life Guaranteed Over 50 plan. This entry was posted on Saturday, October 16th, 2010 at 3:30 pm and is filed under Money. You can follow any responses to this entry through the RSS 2.0 feed. You can leave a response, or trackback from your own site.